Toddlerhood is a fun and… complicated age for parents. These tiny adventurers are intensely curious and full of energy, which can be difficult when you add in wobbly walking, threenager independence or the trickiness of potty training. Not all kid-friendly activities suit the needs of toddlers, so I’ve put together 12 fun things to do in Boulder with toddlers and preschoolers. Where: For a map of all five libraries in Boulder, click here. Time: View today’s library branch hours here. Boulder offers five public libraries in different areas around town, all of which offer youth storytimes! Programs vary from lap babies to wobblers & walkers to toddlers and all-age storytimes. For the full schedule of youth storytimes for each library branch, click here. A kid favorite. Join the musical duo Jeff and Paige for evenings of children’s music and nature education. The evening consists of a short hike, followed by 45 minutes of nature music at the foot of the Flatirons. Sponsored by City of Boulder’s Open Space and Mountain Parks Division Meadow Music is an award-winning environmental education program at Chautauqua Green in Boulder, Colorado.! Meet us at 5:30 to start a short hike that’s friendly to all ages (we recommend arriving early to find a place to put your picnic blanket before the hike). After our hike we return to Chautauqua Green for a concert full of our original nature and science-based music. The concert starts around 6:00pm and ends by about 7:00. Bring a blanket to sit on, a picnic and some silliness. Cost: Children (ages 1-11): $9, Adults: $5, Infants (under 1): Free, Members Always Play for Free! Just a short drive out of Boulder, the World of Wonder Children’s Museum in downtown Lafayette is a favorite for young children. Designed for interactive learning and play, WOW features a light & music room, an art room, a little clinic, a sandbox, a theatre area complete with costumes and stage and so much more! Kids can spend hours exploring this fun museum. There is a snack area with vending machines available. The University of Colorado’s Museum of Natural History is fun, educational, interactive AND parent-friendly! The museum offers kid-inspired exhibits (right now — Curious Connections in Nature!) and a cute gift shop on the main level. In the lower level, kids will have a great time in the interactive play and learning area. Right outside the play area parents can enjoy a nice, FREE cup of coffee or tea in the museum’s BioLounge with comfortable seats and inviting atmosphere. Family-friendly bathrooms are located upstairs. While there are beautiful staircases in this beautiful, old building, there is also a centrally-located elevator making the museum handicapped and stroller-friendly. Admission is free, donations are accepted. The gift shop offers a fun array of science-inspired items. Paid parking is located South of the museum. Your child is sure to get a kick out of the fun, colorful paddle boats at Waneka Lake Park‘s Boathouse. Parents can rent the paddle boats by the half hour (which come with complimentary – and required – life vests). Enjoy a calm, fun boat ride on a swan, flamingo, dragon or duck! For all the details, click here. East Boulder Community Park features a dinosaur-themed playground that is nearly surrounded by fencing, making it easier for parents to keep tabs on running toddlers. Much of the playground is toddler-friendly, in addition to structures that older children will enjoy. Covered picnic tables provide shade as well as a great place for a picnic. North Boulder Recreation Center recently opened its newly renovated zero-depth entry leisure pool. The pool features slides, fountains and spray features and other water play structures all at a comfortable 87°. Add all that up with family locker rooms and you have a great place for a fun morning at the pool. Cost: Thursdays and Fridays $13/person, Saturday and Sunday $15/person. Under 12 Months FREE. Tickets available here. 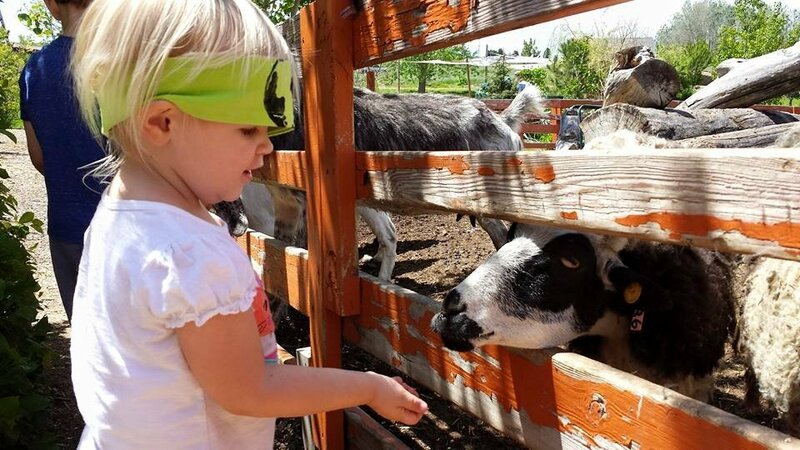 Sunflower Farm is a rural haven in South Longmont where kids can feed goats, sheep and llama, jump from hay bale to hay bale, play in the corn house, playhouse and sandboxes, explore the tree forts and bridges, hold a chicken, soar down the zipline, balance on the slackline. There is even an old airplane to explore. On weekends 10:30 to noon, draft horse rides are available. All activities are covered by a single admission fee of a ticket—no other fees apply. Pre-purchasing tickets is encouraged, the farm frequently sells out. Purchase tickets here. Cost: Class schedules & prices here. Disappointed that ski season is over? Shredder Urban Ski & Snowboard Park has got you covered! Shredder is an amazing indoor ski and snowboarding facility for ages 10 months to adult. Shredder offers ski and snowboard school classes and summer camps to all ages, including freestyle fundamental classes (starting at age 8), Yeti School (10 months to 3 years), and beginning adult skiers/boarders. The Butterfly Pavilion is home to over 5,000 animals! Kids will be immersed in a tropical rainforest where 1,600 butterflies live and Rosie, the tarantula is ready to be held by brave children. Step to Water’s Edge to be immersed in an underwater world full of sea creatures. The pavilion features lovely gardens, a nature trail, an indoor children’s play area as well as a fun gift shop. Toddlers and big kids alike will love Louisville Community Park‘s splashground! There’s nothing like water to keep a toddler’s interest. This fun splash pad is located right next to the park’s play structures as well as grassy fields. YES, there is a bathroom at this park! Nederland’s Carousel of Happiness is a magical menagerie featuring 56 whimsical, hand-carved animals on a restored 1910 Looff carousel! This lovely carousel turns to the music of a 1913 Wurlitzer band organ. Witness the 100-year old gears churn by watching from the upper observation window. Wheelchair ramp available. Rachel, I can attest to the great program at Shredder! I took my grandson (age 3) there for ski lessons for two seasons. I’m very experienced in early childhood education, and so is Shredder owner Brooks. At the end of the first lesson, when Brooks came out to give a recap to the adults, he described the program as “play-based.” I was impressed by his knowledge of how children learn, and the program does what he promises. He and his staff are very patient and understanding with young children of varied abilities and interest. I’ve recommended this program to lots of people and loved seeing it here on your list. Thanks for sharing your experience Anne!